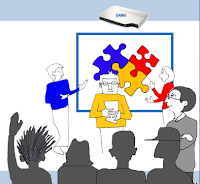 Open forum for the educational community with a selection of resources and ideas for teaching and learning with ICT support. Includes activities for interactive whiteboard (IWB), document reader and electronic voting systems. The first set of models is focused on the activity and initiative of the teacher. Students participate answering questions, asking questions and doing exercises assigned to them by the teacher. The use and control of the DWB lies entirely in the hands of the teacher. In models focused on the activity and initiative of the students, the student takes the role of the teacher, prepares material to be discussed in class, explains topics and asks questions. Although the students are given a great deal of freedom to develop these activities, it is the teacher that coordinates their work and gives comments on their final presentations. The teacher encourages the rest of the class to join in on the evaluation and correction of work. 2.- What should make the Educational Administration? 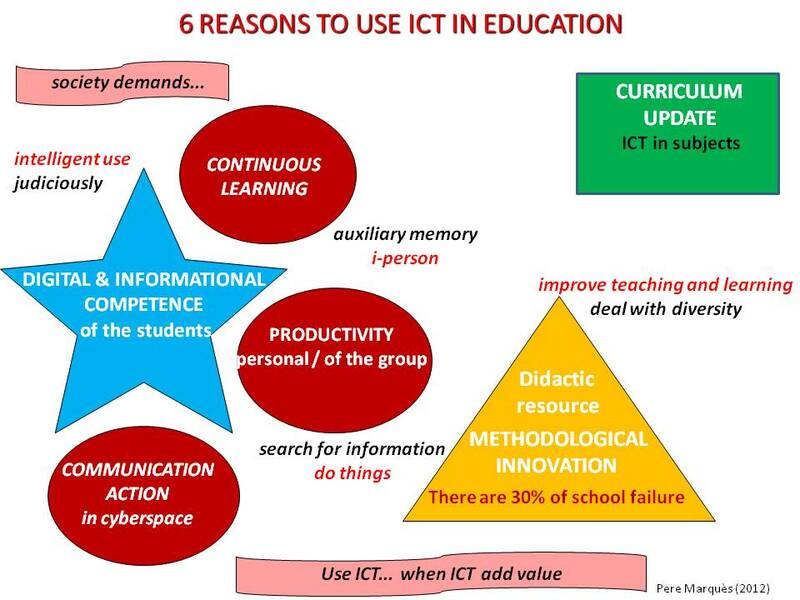 1.- Why ICT in Education? Laptops and electronic whiteboards, some called Classroom 2.0, can help improve the teaching of secondary school students. Various investigations carried out by the Research Group "Teaching, Innovation and Multimedia" DIM-UAB (Aulas 2.0, Aulatice, Digital-Text, Educaline ...) have shown that these resources alone do not improve student performance but using appropriate methodologies with good content can improve the skills acquired. It also summarizes the principles of the bimodal curriculum, curricular approach that allows you to provide better training to students, with a greater focus on skills development, and that can affect an improvement in their academic performance and reducing school failure. - Classroom of Digital Tablets. Tablets are arranged in a specific class (which will also have a interactive whiteboard and a computer support) and we moved students there when they should carry out any activity with the support of the tablets. A teacher or technical specialist shall be responsible for the care and maintenance of equipment and management of the timetable where teachers make their reservations in advance of the classroom. This model, which involves creating a classroom where technology resources are concentrated, we believe it can make sense when a center (to impart a specific subject, such as in Professional Training) needs to have a classroom with very high performance computers. However we consider it inadvisable when devices are digital tablets, much cheaper and, above all, easily transportable, because students should be moving between classrooms. - Some Digital Tablets as a support for class. The classes have a few digital tablets, always available to teachers and students, which are used to make various individual and group work. This model is convenient for teachers and students: the technology is already in the classroom and does not require moving to another classroom. However, as there is no one tablet for each student, while some students do certain activities with tablets, others must perform other tasks without this technology support. It may be a good model for initial introduction of these devices in the centers. Thus teachers can take experience and are formed with easy activities meanwhile students become more familiar with their educational possibilities and with the usage the rules to be respected. Coupled with the possibility of having a digital tablet trolley when necessary, can be a good model for the childhood education and the first year of primary school. - Digital Tablets Trolleys. The center has several trolleys with tablets (facilitating transport, storage and charging them), that teachers can move into their classrooms when required. Generally each trolley (contain between 20 and 40 tablets) is assigned to some classrooms located in a specific area, minimizing displacements. For good service management, every trolley should have a teacher responsible for its care and maintenance (when no one uses the trolley it will be stored in his classroom), who also will manage the schedule table where other teachers will reserve the tablets for their classes. This model, although that do difficult the improvisation of the activities with tablets (the trolley must be booked in advance) and is an inconvenience have to move trolleys between classes, prevents the movement of students between classes and integrates the instrument in the classroom context and educational activities when is necessary that each student could use a tablet. - Digital Personal Tablet to each student. In our society today, where there is a ubiquitous Internet presence and we always have at our disposal one of these digital devices (digital tablet, computer, Smartphone ...), the school must train students to act in this context using these tools properly (as we do with the calculators). We therefore consider advisable and increasingly necessary, to form the students considering that now in addition to paper, pencils and books, they also have always at their disposal one of these devices: digital tablet or netbook. 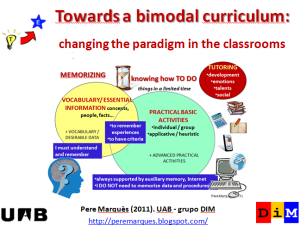 View our proposal about "curriculum bimodal" <http://peremarques.blogspot.com.es/2011/09/que-es-el-curriculum-bimodal-i.html> that besides updating the educational objectives, teaching methodologies and system of students assessment , can contribute to a significant reduction of school failure. 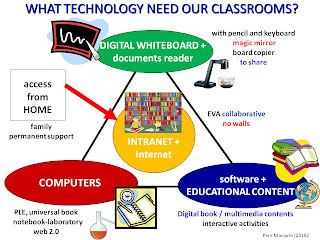 In this context, if we have the appropriate infrastructure in the classroom (Internet access, interactive whiteboard ...), the use of this technology allow to apply a working model in the cloud (and off-line) with content interconnection between different devices (digital tablets, netbooks, smartphones, interactive whiteboard ...) and permanent communication network between students and education agents. 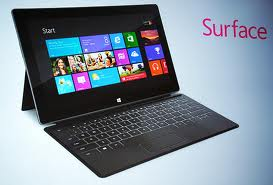 Tablets are property of the center and are stored in the classroom where the pupils can use them. Tablets are property of each student; they move them every day from home to school like a book or notebook more in his backpack. The best option in each case will depend on the characteristics of each school and the age of the students, but looking the future, each student will tend to have their own tablet ownership (as he has got his books and other personal belongings). We have a big problem. Largely we are preparing our students for a society that no longer exists. Perhaps that is why we are (Spain) one of the countries of the European Union with greater school failure and more youth unemployment, and at the same time we are also placed in the queue of the OECD countries in academic performance (as the PISA tests). We are doing many things wrong. We patched our encyclopedic traditional curriculum with additives of "competencies" rather than develop a new curriculum according to the requirements of our times. We say we innovate with ICT in the classroom, when we used ICT to do basically the same thing as always. We are developing "student-players memory" when society demands "innovative people-Google" able to meet new and changing situations. This cannot continue. Immediately we must make a clear and objective diagnosis of what is wrong and also recognize the mistakes of the past as indispensable starting point to adjust our educational system to new times and establish an appropriate plan of action in this regard. In addition, under the current economic situation, we have limited resources, so that once developed the action plan will need temporalize actions prioritizing those that have an effect on core problems, which are the cause of many secondary problems, and those that have greater impact on student achievement and the quality of their training. In this context, we begin here the publication of "roadmaps" that are intended to guide decision making toward improving education. Considering the current economic constraints and other conditions of learning contexts, are guides to introduce some of the most essential innovations in our educational system. Today, few people question the desirability of integrating ICT in schools or the need for students to use them and acquire the digital skills or the digital literacy. If the reader doubts I suggest you check: "Keys to educational change: Technology and Methodology, Curriculum and Assessment"
Considering that we are clear that we must integrate ICT into the classroom and we are clear why and wherefore, the issues addressed in this task list are: where do we start the integration of ICT in Education? , how we can do it given the current economic constraints and the necessary adjustments with other key elements of our educational community? Considering the "6 Keys to successful integration of ICT in Education" we present a proposal to the classrooms of the stage of compulsory education, contemplating an integration process into two stages and a "permanent laboratory of educational innovation with ICT". 1. – Digital whiteboard in ALL classrooms. A digital whiteboard is a computer connected to the Internet and with a projector. Anyway, if you can have an interactive whiteboard (IWB), better. Today there should not be a classroom without whiteboard. The range of learning activities we can perform multiplies tremendously. And in addition to providing added value to the implementation of many 'traditional' activities, allows the realization of many new learning activities focused on the activity of students and on the development of their skills. If the classroom has Internet access, it would be enough get an old computer and buy a simple projector of 300 Euros to have a basic whiteboard. Once we will have money, then we can buy the interactive whiteboards. Meanwhile, we cannot have classrooms with blackboards of nineteenth century, when by just over 300 euros we can provide them with a digital board and multiplying the chances of student learning. We also recommended to equip classrooms with a document reader. The multimedia learning resources offer teachers and students: information and guidelines for systematic learning, self-correcting exercises, large libraries and databases to explore and search data, simulators where to make all kind of experiments, building tools, environments for collaborative work ... This resources, well used on the whiteboard, and in the home or school computers, will permit us to perform many new activities that can facilitate the learning of students. 4. - "Initial training" essential for ALL teachers in the educational use of ICT, guiding the application of current teaching methods in the classroom and the work with a bimodal curriculum focus and considering the specific contributions of ICT to the various subjects and their teaching. The initial training will be necessarily face training, and better than is carried out at the school itself. In future articles we will propose a roadmap in this regard. 5. - ICT coordinator. It is necessary to consider time availability sufficient to the teacher ICT coordinator, who will provide support and training on the educational use of ICT to other teachers. 6. - Inclusion of digital skills in the curriculum. Mention in the School Educational Project and consideration at the Classroom Curriculum. 7. - Computer classrooms, according to the schools’ needs. As the school can increase its provision of classroom 2.0, laptop trolleys ... then it will decrease the need for these classrooms. We do not recommend major investments in computer rooms, it is now more appropriate extend the provision of mobile carts with laptops that can be shared by several classes according to their needs. STEP-2: Progressive actions, once achieved at least the first 6 objectives of the stage-1. Of course, the resources listed below are also very important, are essential for schools today. But if we have limited financial resources we have to prioritize. And so, for reasons of lower cost, ease educational use, great teaching potential and efficiency, we have prioritized the digital whiteboard in the stage-1: first of all, we should have digital whiteboards in all classrooms. On the other hand, once achieved the objectives of the stage-1, which are "essential", the objectives for this phase-2 affect key aspects to consider, although according to the characteristics of the centers can support other than concretions those raised here. 8. - Some support computers in every classroom, according to the demands of teachers. 9. - Learning and management platform, website... The intranet will facilitate educational school management, contact with families and the multiple activities of teaching and learning. Some schools produce their own educational platform with free resources (likeMoodle) or closed social networks. But generally the centers take advantage ofeducational and management platforms that provide some Ministries of Education or acquire the services offered by educational publishers and specialized companies. 10. - "Basic training" in the educational use of ICT for teachers. This training, among other things, will ensure that each teacher has his teacher blog (or other online educational space) and is integrated into a social network of educators. Like the “initial training”, we believe that this “basic training” must also be face training and at the school itself. This training can largely be the responsibility of the "ICT coordinator". It would be nice that schools are self-sufficient in training for the educational use of ICT of its teachers, using the knowledge of different teachers, and especially the ICT coordinator. 11. – Progressive provision of “1 to 1 classrooms” (one computer to student) and laptops for teachers. 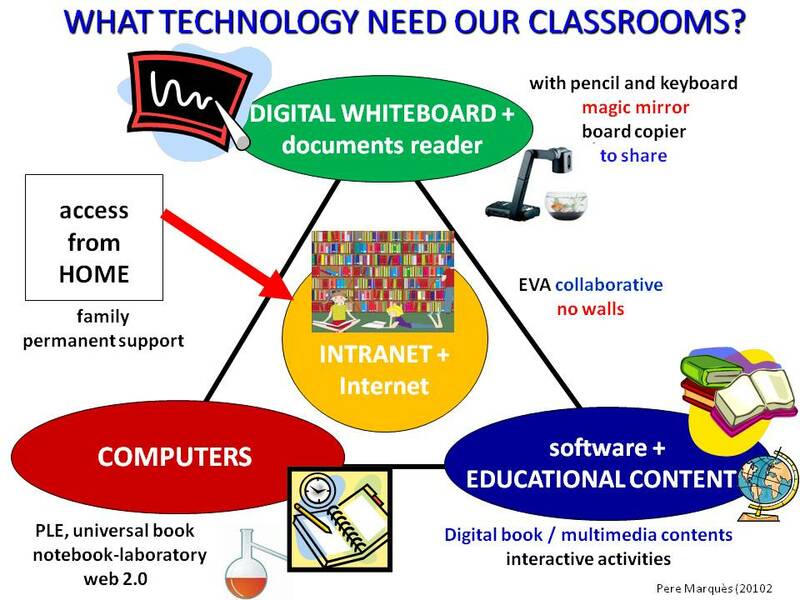 The “1 to 1 classroom” multiply the range of possible learning activities to do with students, and also facilitates the use of Web 2.0 resources and develop their digital skills. Considering that in our country currently about 90% of families with school-age children have computer at home, we believe it is more efficient to have laptops owned by the school (not necessary that families buy them for their children). Where appropriate, school will advise parents so they can buy a family computer, and in cases of poverty, school (perhaps the AMPA) could have scholarships or loan facilities of computers. Moreover, as the use of laptops in the “1 to 1 classroom” is usually between 30% and 50% of class time per week (there are many activities that will continue to do better without ICT), one trolley of laptops can service 2 or 3 classrooms. In this way we can reduce the cost of buying and maintaining computers. It’s better to have a laptops trolley in every classroom, but if there are not sufficient financial resources, this can be a good option. 12. - School Maintenance Technician. In the same way that schools have concierges and administrative staff, when it increases the technology park is essential to have on staff a computer technician. 13. - Complementary training "on demand" for teachers. Often through virtual environments. 14. 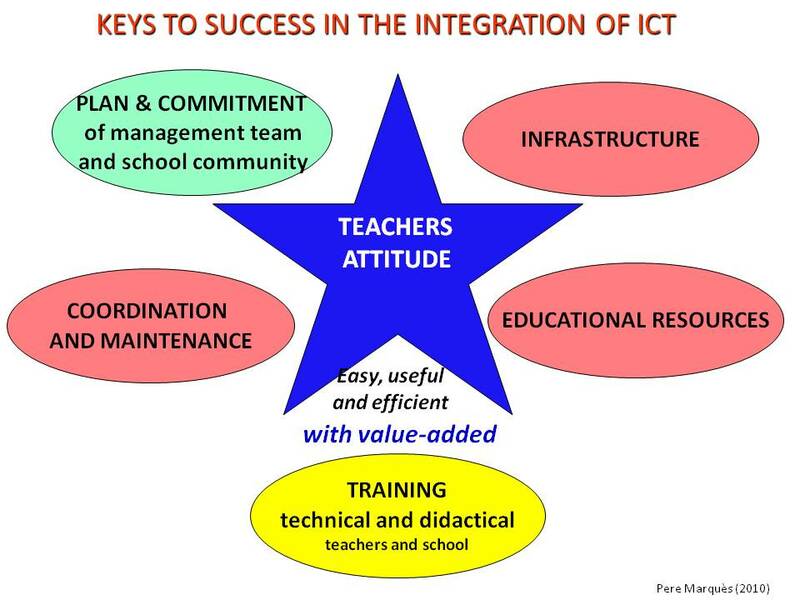 - System to evaluate the use made of ICT and its impact on student learning. We need to analyze what we do and its results to make adjustments and continue improving education, which is what we want to do. Permanent laboratory of innovation with ICT. Beyond these guidelines, the centers should support initiatives that may have some teachers to experience new learning activities with technology resources: use of digital tablets, social networking and other Web 2.0 resources, QR codes, augmented reality. 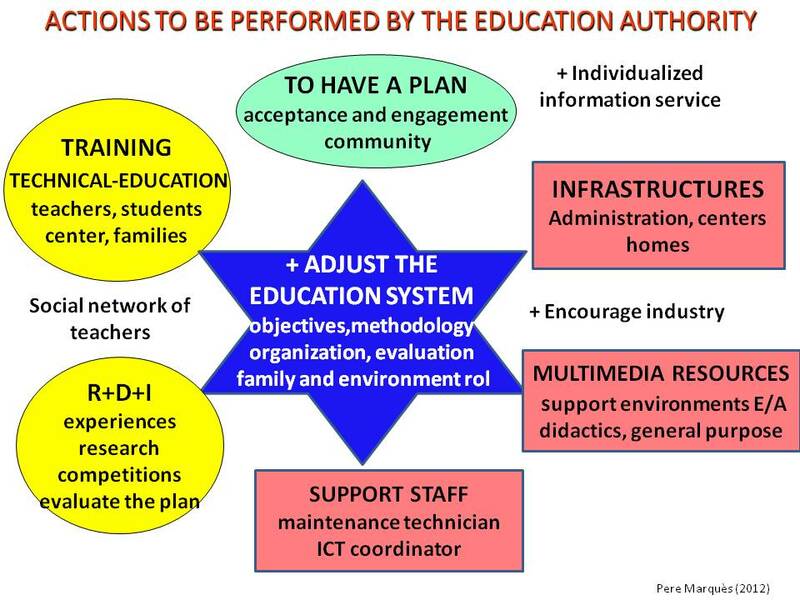 In a future article will be completed this roadmap for the integration of ICT ineducation, expanding some of the points mentioned. Meanwhile, we welcome comments and suggestions. What is the bimodal curriculum? Understanding culture as the "set of representations, rules of conduct, ideas, values, forms of communication and behavior learned patterns (not innate) that characterize a social group" (Quintanilla, 1992), economic globalization and constant cultural and scientific advances, especially the construction of Cyberspace, have conducted profound changes in our cultural substrate forming a "new technological paradigm organized around Information Technology" (Castells, 2000:60). So today among the instruments that most of us have ALWAYS available when we are building learning or carrying out a task, besides the traditional pencil and paper we also have Internet access (via mobile phones, digital tablets, computers...). The Internet helps us to locate any type of information we may need and multiplies our possibilities to communicate and work in Cyberspace, this parallel world where we can do more and more things each day and where we consequently spend more and more time. The Internet has become so important that in some of its reports the UN has considered “free Internet access” as a human right and is promoting governmental actions against the “digital gap” (El Mundo, 2011). The changes in our vital context are substantive and force us to face new challenges but also provide us with new resources and new possibilities. The (almost) permanent access to the Internet gives us access to an alternative parallel world where we have the chance to make most of our activities. It is like our brains had been expanded with a new lobe (the Internet lobe) that can ALWAYS access any information we are interested in. This is not the result of a mutation and does not give us onmiscience, but it is certainly a first-rate evolutionary leap in human evolution. Now some people (specially those who can be identified with what has been called the "i-Person", that is to say, people who have integrated i-devices, such as the i-Phone, i-Pad, etc. in their daily life) are potentially much more powerful than other "Homo Sapiens" because they are adapting better to our new cultural scene (Marquès, 2011 b). In this framework, Education, today as always, aims at helping students develop their full potential (intellectually, emotionally, morally, physically, etc.) and transmitting them the culture of our society, so that they can become functioning members of society, help others and live a satisfactory life themselves. This function of culture transmission, however, requires a thorough review of the curriculum that we develop in schools. If today we have a "New Culture", new tools and new forms of communication we cannot continue teaching and assessing students with the goals, instruments and procedures of the past. Because although it is said that new generations, the "digital natives" as Marc Prensky calls them (2010), are very skilled using IT, the truth is that this ability is manifested only in what interests them (playing, searching for music and movies, interacting on social networks ...) Although many times we can see in them some of the characteristics that Prensky points out (like predisposition for multithreading, interaction in screens, sharing, nonlinear accessing to information with preference for the textual versus multimedia...), most of them are not familiar with many of the risks of Cyberspace and don’t know how to select the most efficient tools and methodologies for their homework. This is because the development of the good judgment needed for the selection of information and tools requires training and plenty of practice time, and these are not promoted in schools where little attention is paid to Cyberspace, even though when Cyberspace has become today a parallel world where students (and more and more citizens of all ages) spend many hours a week. Should we start thinking of complementing the classic subjects of "science" and "social sciences" with a new subject, the "Science of Cyberspace"? The changing cultural scenario of the Internet Age is forcing us to evolve into the i-Person, always connected to the Internet. Now, whenever we have to carry out a task, we can (almost) always go on the net and find the information we need in a more and more stable and faster and faster Internet. We can do this provided that we know how to search, that is to say, how to do it efficiently and in a limited time, not spending hours clarifying concepts in reference sources (like Wikipedia and others). So in addition to knowing how to search, we need to have a good vocabulary, which will free us from having to be constantly looking up words in encyclopedias and other reference sources on the Internet. Here, remembering having made similar previous experiences will be of great help. In this context, for each subject and grade, the teacher will decide at the start of course the 50 or 100 concepts (processes, events, characters...) that students should memorize and integrate into their mental frameworks (to know, to understand, to use, to able to explain) by the end of the course. These concepts will make up the essential vocabulary and data list. Optionally, the teacher will also prepare a second list of words and data that he considers not essential but desirable for students to know by the end of the course, this will be the desirable vocabulary and data list. Students will receive these lists at the start of course and will know from the beginning what they are expected to know by the end of the course. In each class session a part of this lists will be systematically worked, with multiple learning activities (individual, group and collaborative) oriented to memorize these contents, like for example exercises with the glossary, interest centers, project work... Probably teachers will continue doing many of the exercises that have been “traditionally” done at school, but we can use all kinds of methods (traditional or innovative, with or without IT), taking into account that the aim is that students understand, memorize and integrate into their mental maps this information... so that they are able to recognize these words (in documents and oral discourses), to use this words (in thinking, speaking and performing other activities) and to explain (define each of the words of this vocabulary, accordingly to their age and grade). We know that people remember easily the information that they use often. Therefore we must provide students chances to use this vocabulary and data, so that they can learn it by carrying out new activities (alternative definitions, relationships, creative writing...) requiring its use (functionality and transfer of learning) and being presented with questions that trigger their relating and reflecting skills. Many of the learning activities focused on memorizing vocabulary and data will be done without IT support, however the review and study of media content and the practice with self-corrected exercises of digital textbooks and other educational Internet platforms will be a great help for teachers and students. 2. – Practical activities for applying knowledge. They are activities involving the execution of a task (to solve problems, analyze sentences and processes, assess situations or materials, plan and develop projects, synthesize, create...). The approach of the bimodal curriculum requires that students are ALWAYS able to make these practical activities with the support of their "auxiliary memory", reviewing their notes, books, the Internet ... The teacher will decide in each case which information sources can be used. The goal is that students get used to work with the supports that are always present in the Internet Age (notes, books, the Internet and other IT tools). Of course, all tasks will be assigned a specific time that must be respected, so that students who do not possess the essential vocabulary and who have no experience in similar tasks most likely will not be able to finish the assignment in time, since searching and finding information on the Internet takes time. These “practical activities” include also some activities, like psychomotor development, mental agility or development of cognitive functions, in which the consultation of external sources does not bring anything or, like exercises where an immediate answer is required, will simply not be possible. These are not memorizing activities in themselves but must be however executed with the resources that each student has available in their memories, like for example mental arithmetic or identification of elements in a photograph. Practical activities with documentary support will sometimes be done individually, to strengthen the students’ autonomy and self-confidence, and sometimes will be done in groups, to promote mutual support and collaborative work. In any case, in these activities students should not memorize data (since they have the data already on the net) but should acquire new experiences that will leave a mark on their memories, so that when they remember them in the future, their self-confidence will be strengthened and they will find performing similar tasks easier. Performing the same activity in different contexts over time will allow them to accumulate experiences that will enrich their "know how" (knowing what they have just learned or read in a manual) and will provide them "criteria" to adjust better and better their "know how" to the context in which they must work in. Furthermore, the execution of these activities requires students to apply various cognitive skills (analysis, synthesis, hypothetical-deductive reasoning, assessment, exploration, selection, creation, planning...) and with that they will develop their intellectual abilities and basic skills in general. In this context, for each subject and grade, the teacher will decided at the start of course the practical activities that students should know how to perform by the end of the course (basic list of practical activities). Optionally he will also prepare a second list of advanced practical activities. Students will receive these lists at the start of course and will know from the beginning what they are expected to know by the end of the course. In their classes teachers may apply all kinds of methods (traditional or innovative, with or without IT) but here the use of IT resources will enlarge greatly (in quantity, educational potential and relevance of learning) the range of possible learning activities that we can offer students. 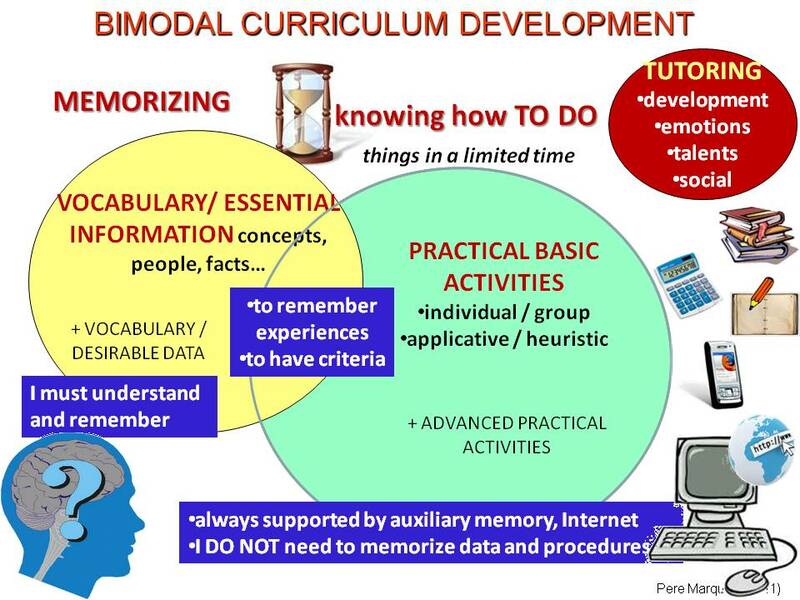 The bimodal curriculum approach fits into the framework of George Siemens’ connectivism theory of learning that focus on today’s need of knowing and connecting the changing sources of information. The data we memorize may become obsolete tomorrow, however the right sources of information will always provide us up-to-date information. "Learning (defined as applicable knowledge) can be outside us" (Siemens, 2004). 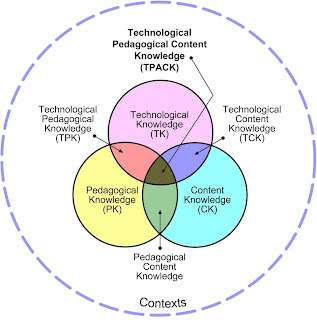 Knowledge is not only inside humans but is also spread across multiple sources of information that students must learn to use according to their interests and needs. On the same line, Professor Manuel Area points out: "With so much information available, it is more useful to know at all times the best procedure to get the right information than to store data in case it may be useful in the future" (Area, 2008). How are exams like in a bimodal curriculum? 1. – Exams with memorizing exercises to verify that students have learned the basic vocabulary and data of the subject and that they are able to explain it: essential and desirable lists of vocabulary and data (the knowledge of the desirable list will allow to obtain a higher score). 2. – Exams with practical exercises with support from the "auxiliary memory" (students may have access to their notes, books, the Internet…). These exams will include activities such as problem solving, analysis, grammar, text commentaries, summaries of documents, relating historical facts and circumstances... They will refer to lists of basic and advanced practical activities. The advanced activities will allow them to obtain a higher score. Teachers will specify a limited time for each exam. It is recommended that exams include some practical activities (compulsory for all) and other complementary activities with advanced exercises (for those who wish to obtain a higher score). In these exams, students that usually do all class exercises and homework using their documentary support (“auxiliary memory”) will not need to study to prepare the exam. The exam will be similar to a class exercise and students will be able to use their “auxiliary memory”: notes, books and (if the teacher allows it) the Internet. Our starting proposal for compulsory education, and that each teacher can adjust to subject, grade and circumstances, is that memorizing exams (vocabulary and data) be between 33% and 50% of the total score of the subject. What do we mean by "auxiliary memory"? Having a permanent Internet connection, the "i-Person" can always access the vast sources of information in Cyberspace to search and find the data needed at any time. When, for example, we are watching a historical film and we want to place a character in its historical context and the historical references that we remember, we can quickly access this information on our Smartphone or tablet. If we are good searching on the Internet (one of the key activities that should be learned at school today), in a few seconds we will get the answer. As Dolors Reig says, "the Internet becomes our external hard drive, the place where we store a lot of things that before we could only learn" (Reig, 2012). In this sense, today Google has already become our external memory always available. In this way, we can change the way we learn: we may retain the information directly in our brains or recall that it is on the Internet (sometimes even remember where on the Internet it is). According to research by Betsy Sparrow, assistant professor of Columbia University (New York), published in the journal Science, as the Internet provides a kind of collective memory, people stop remembering the information they know they can access from their computer but take good care to remember where to find it (Sparrow et al., 2011). That is, we tend to store less information in our brain memory bank and use the Internet as personal data bank, such as an "external auxiliary memory." Moreover, the brain still remembers the specifics of the issues that interest us. As George Siemens says: "Technology is altering (rewiring) our brains. The tools we use define and shape our thinking. Many of the processes previously handled by learning theories can now be made, or supported by technology”. 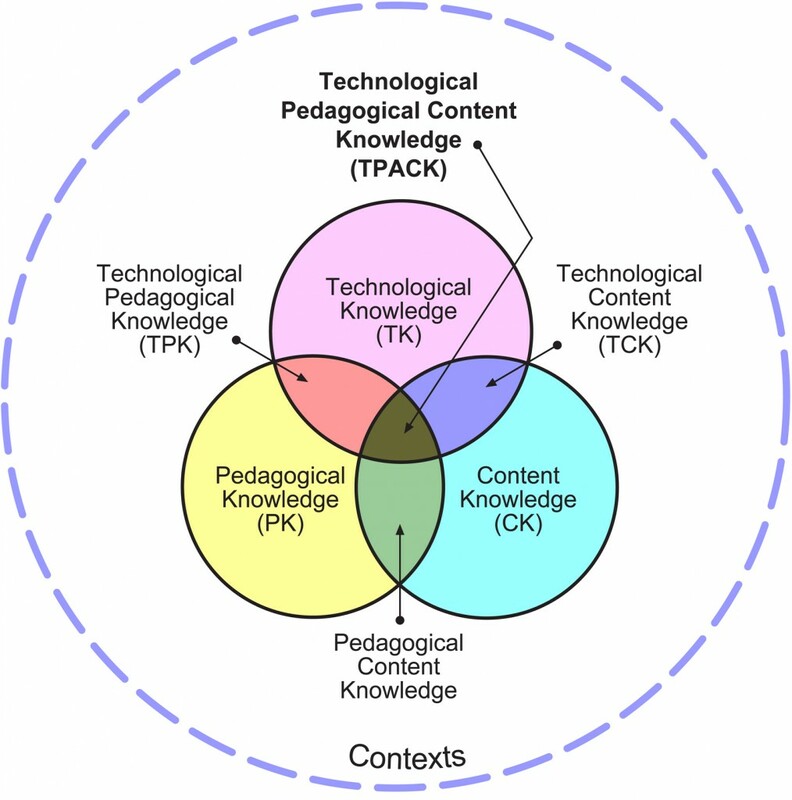 “Knowing how and knowing why are being supplemented with knowing where (the understanding of where to find the required knowledge)" (Siemens, 2004). The pipe is more important than its contents. According to Siemens, it is a challenge to activate the previously acquired knowledge in situations where it is required. However when the required knowledge is unknown, our ability to connect with sources that can provide this knowledge becomes essential. As knowledge grows and evolves, our ability to learn what we may need tomorrow is more important than what we know today, the access to what is needed is more important than what is already known. Therefore, "nourishing and maintaining connections is needed for continuous learning" and "the ability to see connections between fields, ideas and concepts is a key skill." (Siemens, 2004). In this context we must consider that searching information on the Internet always takes time. Therefore, despite the continuous availability of Internet content, to make our access to information (documents, links, videos...), contacts (people, networks...) and Internet tools related to our regular activities easier and faster, a good option is to build an environment (web, blog, wiki...) where we can store and order all these resources as we find them, so that when we need them, we can find them much faster. When we don’t find what we need in our “auxiliary memory”, we still are able to search information on the Internet using search engines and also asking our colleagues in our social networks. The “auxiliary memory” is a personal environment that students should start building at school, little by little. Young students may start with a notebook, folder or portfolio where they can collect notes and clippings of interest. Later students can begin creating their first personal digital environment on the Internet. When applying the bimodal curriculum approach, the “auxiliary memory” will immediately be useful, as it can be used as a support for practical activities and also as a "vademecum" where students can synthesize the vocabulary and data they have to memorize. Ultimately the matter is that students build their memory (its representation of reality, of the world) as always from the information they receive, from their learning, their actions and experiences, etc. but now they distribute this information between the usual space of "brain memory" and the new, always accessible space that we call "auxiliary memory". 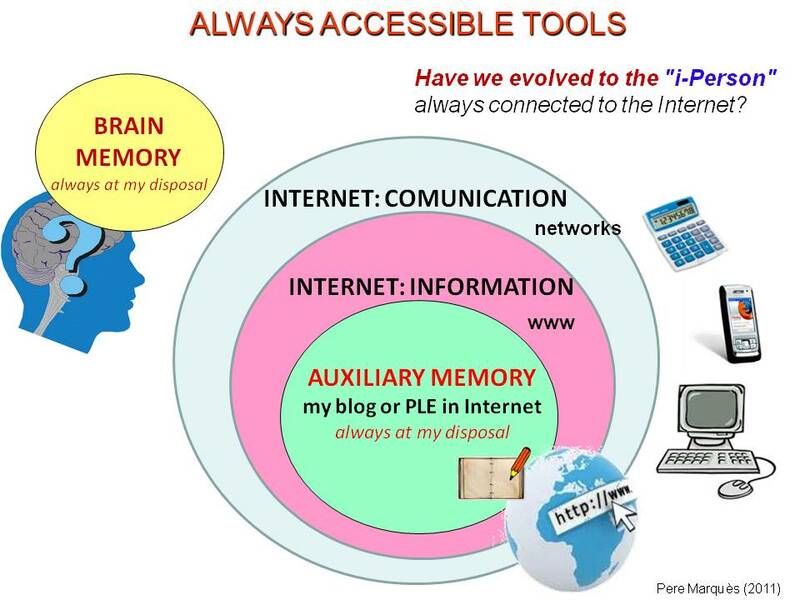 The concept of "auxiliary memory" is close to the so-called "Personal Learning Environments" (PLE): "a set of tools, information sources, links and activities that a person frequently uses to learn" (Adell and Castañeda, 2010). The “auxiliary memory”, however, is an environment that can be useful in many different circumstances throughout life (not only during learning activities): studies, work, leisure, etc. Andreas Schleicher, head of the OECD PISA program, summarizes the new role of education in today's world where information sources are always within our reach, "educational success does no longer mean to retrieve content knowledge but to extrapolate what we know and apply it to new situations. Education, therefore, has to do much more with ways of thinking, creativity, critical thinking, problem solving and decision-making; with ways of working, including communication and collaboration; with tools, including the ability to recognize and exploit the potential of new technologies, and the ability to live in a multifaceted world as active, responsible citizens" (Scheleicher, 2011). In this context, PISA tests are part of the assessment of competency-based learning. They assess the students' ability to extract and process information in a task-solving situation. Although so far authorizing students to use their "auxiliary memory", or any other source of external information, has not been considered in these tests, the tests overall provide the basic information needed to perform the required tasks, mostly practical activities. (To see some of the activities for reading comprehension and math, please refer to <http://docentes.leer.es/wp-content/pisa/index2.html> <http://evalua.educa.aragon.es/admin/admin_1 / file / Math% 20PISA.pdf>). These activities do not intend to measure the memory of young students but are meant to proof that students can do them. Moreover, the OECD (Organisation for Economic Co-operation and Development) claims that in the near future some tests will be able to be answered on a computer (LA VANGUARDIA, 2012). Will there be less school failure with the bimodal curriculum? Currently there are many students who fail "test problems" because they do not remember the formulas. Well, with the bimodal curriculum approach this will not happen again. The students will only fail if, even with the help of their notes or the Internet, they don’t know how to solve the problems in the given time. By freeing students from the pressure of memorizing so much content, since in the bimodal curriculum approach many of the exercises and exams (practical activities) will be made with the "auxiliary memory" support, we will prevent that students with memorizing difficulties become unmotivated (due to their inability to remember) and manage to do their exercises and pass their tests thanks to the support of their notes and other information sources. By anticipating their eventual success ("If I can refer to my information sources, I can do it") some students will be motivated to work more and therefore learn more. This is the result from research conducted at UAB DIM about "new techniques against school failure" <http://peremarques.pangea.org/casio/> during the school year 2010-11and that will continue on 2011-12 . It is particularly sad that much of this 30% of students who fail in their secondary-school studies fail due to memorizing tests, without having been able to proof that, beyond this limitation (often they simply do not want to spend hours memorizing things meaningless to them), they have a capacity (sometimes brilliant) to develop the skills necessary for social integration. And I say that it is especially sad because they are forced to memorize many things that no longer needed to know by heart… because they are available in their i-Phones. And how is the full development of students like? As mentioned in the introduction, Education as well as ensuring cultural transmission must provide each person with the maximum development of their faculties and for that, today as always, we must perform many different activities next to memorizing tasks and practical exercises with documentary support. The tutoring activity of teachers in this regard, and especially the work of the tutor-teacher of each student, is the substrate on which to build the bimodal approach of the curriculum. - Accepting that we are in an "i-Person" world, always connected to the Internet. - Considering, as part of a careful tutoring action, that there are two types of learning activities: memorizing activities and practical activities. - Allowing always students to do practical activities with documentary support (“auxiliary memory”). - Providing students at the start of course with the vocabulary and data that they will have to memorize and with the practical activities they will have to learn by the end of the course. 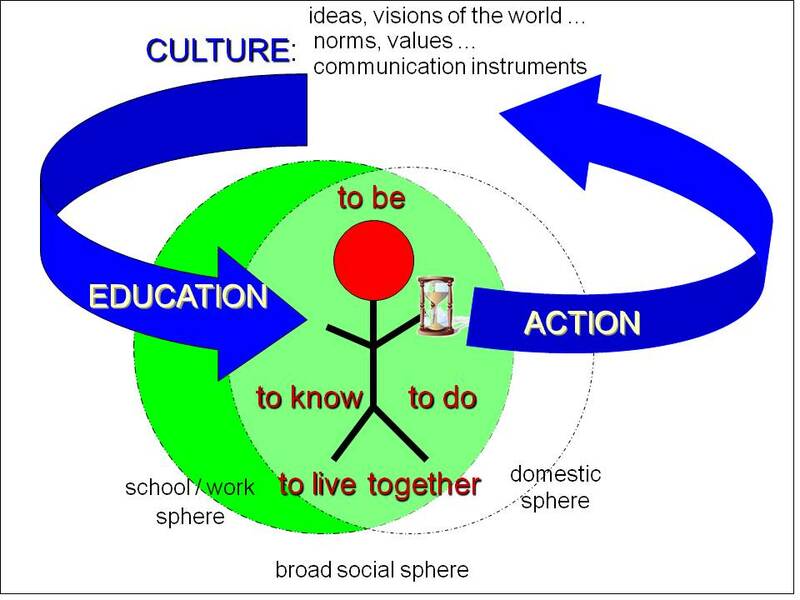 While waiting for education authorities to conduct a thorough review of the official curriculum and upgrade it to the demands of modern society, considering the concept of the "i-Person" and beginning to implement the bimodal curriculum can help providing a better education to students and can contribute reducing school failure. Currently this bimodal approach to the curriculum is implemented in 24 schools in Spain and 5 schools in Latin America, in the context of a research carried out by the research group DIM-UAB <http://peremarques.net/telefonica/> and sponsored by the Telefónica Foundation. CARR, Nicholas. (2010). ¿Qué está haciendo Internet con nuestras mentes? Superficiales. Madrid: Taurus Santillana. CASTELLS, Manuel. (2000). La era de la información. La sociedad red. Vol.1 Madrid: Alianza. GARDNER, Howard. (2003). La inteligencia reformulada. Las inteligencias múltiples en el siglo XXI. Barcelona: Paidós. MARQUÈS, Pere (2011). ¿Electricidad, velas u oscuridad? Reflexiones de un Google dependiente. Blog Chispas TIC y Educación Recuperado el 15-2-2012 en . MARQUÈS, Pere (2011 b). Y la evolución humana sigue: ¿eres ya “i-Person”?.Tecnonews Recuperado el 15-2-2012 en &lt; http://www.tecnonews.info/Y-la-evolucion-humana-sigue--eres-ya--iPerson-/_pE0Aj1BfZN7VtoFZxcYP-P8oHseGtVPsPnm-4Gx9fOuJDsPZhDjFS2ou5OiUHcUe&gt;. MARTÍNEZ-SALANOVA-SÁNCHEZ, E. (2009). De la Tierra al ciberespacio. Comunicar 33; 102-105. QUINTANILLA, Miguel Ángel (1995). Educación y tecnología. En RODRÍGUEZ, J.L. ; SÁEZ, O. Tecnología Educativa. Nuevas Tecnologías aplicadas a la Educación. Alcoy: Editorial Marfil. ROBINSON, Ken (2009).El Elemento: Cómo encontrar su pasión lo cambia todo. Madrid: Grijalbo.